It's a terrible day for notch haters. Samsung, one of the last holdouts in this regard, is ready to give up and join every other smartphone maker in Notchland. At its developer conference today, the company teased three different notch designs that it plans to use for its devices in the near future. From the left to the right in the image below, we've got Infinity-U, Infinity-V, and Infinity-O. These are brands for the displays that will incorporate said notches. As you can see, all three are basically shaped like the letters used to name them. U and V are traditional notches, albeit on the small side compared to what we've seen from other companies. O, on the other hand, seems to be a cutout of the display, meant to house the front-facing camera, but it's in a weird off-center position that might put people off even more than usual when it comes to notches. 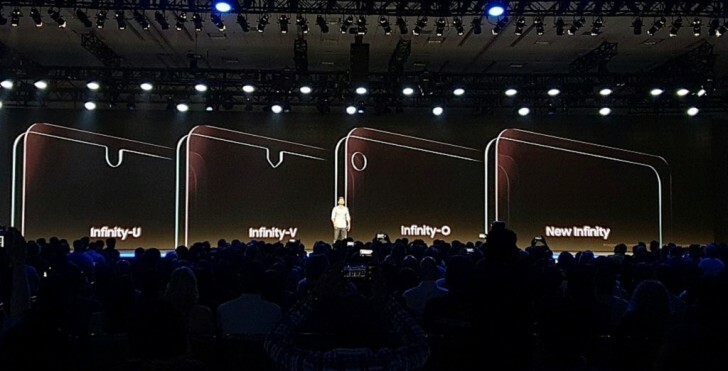 New Infinity looks like the notch-less bezel-less display panel we've all been waiting for, so perhaps future flagships will get this design and the others will only appear on mid-rangers. One can hope. Either way, the era of Samsung not releasing notched handsets left and right is almost over. Brace yourselves.